Sunderland dropped to the bottom of the Premier League when they lost 2-0 to West Brom at the Hawthorns following Swansea's win at Liverpool. Darren Fletcher put West Brom ahead with a volley on the half-hour mark and six minutes later Chris Brunt lashed home from 20 yards to double the home side's lead. Sunderland, who started the game in 20th place after Swansea leapfrogged them with a 3-2 victory at Anfield, struggled to create clear opportunities against a solid and confident West Brom side. Their fourth defeat in five league games leaves them on 15 points, three points from safety. Tony Pulis' men stay in eighth after their third league victory in four games. The Baggies dominated the first-half and deserved their lead when captain Fletcher struck with a goal of high technical merit. 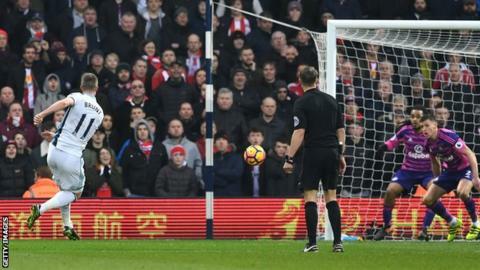 Sunderland failed to clear a corner and the ball was nodded on by Gareth McAuley to Fletcher, who controlled it on his chest before volleying past Vito Mannone on the turn. Brunt's volley soon after might even have been better, and gave the home side a cushion they never looked like relinquishing. The impressive Matt Phillips escaped down the right and his cross was palmed into the path of Nacer Chadli by Mannone, and although the Belgium winger hit the crossbar from close range, the rebound landed at the feet of Brunt, who arrowed home with a pure strike. The Baggies' new £10m signing Jake Livermore made his debut, coming on for the last 20 minutes. Fletcher was involved in an off-the-ball incident with Papy Djilobodji in the 86th minute, which was was not seen by the referee. The Sunderland defender appeared to punch Fletcher at a West Brom corner. Sunderland managed just two shots in the first-half, only one of which was on target, a weak attempt by their top scorer Jermain Defoe in the 41st minute. Defoe, 34, has scored 12 of their 20 Premier League goals this season, but the former England striker struggled to make an impact. He managed just two touches in the West Brom box in the first-half, while as a team Sunderland only had seven touches in Foster's area. Things did improve after the break with sevens shots and two on target - but with six of them from outside the box, West Brom rarely looked in much danger. Sunderland's best opportunities to fight back came from set pieces but too often the delivery was poor, with Sebastian Larsson and Patrick van Aanholt particularly culpable. Victor Anichebe gave his side a boost when he came off the bench for the last half hour as he returned from injury, but it looked as if Sunderland will need to strengthen their attack in the January transfer window if they are to have a chance of survival. Phillips was West Brom's most potent attacking force, causing problems down the right wing and linking up well with full-back Allan Nyom. West Brom manager Tony Pulis: "First half we played really well. In the second you have to give credit to Sunderland, they had more of the game than they did in the first half. "We have done very well. The players have really embraced what we are trying to do and the atmosphere was fantastic again. "Darren Fletcher's goal was fantastic and Chris (Brunt) has a wand of a left foot. We are really pleased. We have a clean sheet in a game that was always going to be difficult for us so we march on." Sunderland manager David Moyes: "We played better in the second than the first, that is for sure. We are giving poor goals away and we are doing everything we can to eradicate it, but it is a disease we have got at the moment. "We led to our own downfall but credit to the boys and credit to young George Honeyman, who was our best player by a long way today. We can take some positives from the game. "We are missing Lamine Kone at the back. He gives a steadying influence. This was always going to be a difficult period. We are making mistakes and I will take responsibility for that. "We are not that far away (from safety). We have to keep going and hope our turn for results will come. We have given away two or three poor goals but our play is not particularly bad - but goals change games." West Brom have won five of their last six home Premier League games, having won just one of the nine before that. Sunderland have lost five consecutive away Premier League games for the first time since November 2013. Moyes has lost five consecutive away Premier League games as manager for the first time since May 2005, when he was manager of Everton. Sunderland host Tottenham, while West Brom travel to Middlesbrough, with both games played on 31 January. Match ends, West Bromwich Albion 2, Sunderland 0. Second Half ends, West Bromwich Albion 2, Sunderland 0. Nyom (West Bromwich Albion) is shown the yellow card for a bad foul. Attempt blocked. Matt Phillips (West Bromwich Albion) right footed shot from outside the box is blocked. Assisted by Chris Brunt. Attempt missed. Jake Livermore (West Bromwich Albion) right footed shot from the centre of the box misses to the right. Assisted by James McClean with a cross. Jermain Defoe (Sunderland) wins a free kick in the defensive half. Substitution, Sunderland. Fabio Borini replaces Jason Denayer because of an injury. Attempt saved. Nacer Chadli (West Bromwich Albion) left footed shot from outside the box is saved in the centre of the goal. Assisted by Jake Livermore. Delay in match Jason Denayer (Sunderland) because of an injury. Corner, Sunderland. Conceded by Ben Foster. Attempt saved. Patrick van Aanholt (Sunderland) right footed shot from outside the box is saved in the top right corner. Assisted by Jack Rodwell. Attempt blocked. Victor Anichebe (Sunderland) right footed shot from outside the box is blocked. Assisted by George Honeyman. Attempt saved. Billy Jones (Sunderland) header from the centre of the box is saved in the centre of the goal. Assisted by Sebastian Larsson with a cross.